oops somehow i skipped a whole page, sorry! 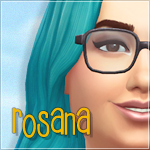 Rosana is a simsfreak she would do everything if she could be a sim. Rosana say that she have most of TS1 games but the thing is she doesn't have non of them. Did u know that Rosana is collecting comic books? Hey, how did you know that??? ?